Fondue has had a resurgence in popularity in recent years, as people have realized it is a delicious food and a fun, social way to eat dinner. In fact, there are even restaurant chains that offer a full modern fondue experience. It is also incredibly versatile, and you can offer dippers that are tailored to your family or guest's personal tastes. Cheese fondue is a creamy, flavorful warmed cheese dipping sauce, into which you and your guests can dip all sorts of food items. This fondue, made with creamy Gruyere cheese, has a subtle garlic flavor. Rub the garlic clove halves all around the inside of the fondue pot to scent it subtly. Discard the garlic or save it for another use. In a medium bowl, toss the cheese with the cornstarch. In the fondue pot on medium heat, bring the sherry, lemon juice, mustard, and nutmeg to a simmer, whisking to combine. Stir in the cheese and cornstarch. Cook, stirring constantly, until the cheese is smooth and melted. Keep the cheese mixture over medium low heat to use it. Serve with dippers. This fondue is a deeply flavored broth made with Asian spices. Simmer the broth in the fondue pot for at least 2 hours for flavor development before using to cook meats and vegetables. In a fondue pot, bring all ingredients to a simmer on medium-high. Simmer for 2 hours. Bring to a boil before dipping the dippers into the broth. Cook the dippers until done. Use animal proteins, tofu, and blanched veggies in the boiling broth. Thinly slice the animal proteins so they cook quickly in the hot broth. Mix 2 tablespoons of soy sauce, the juice of 1 lime, 1 tablespoon of sriracha, and 1 teaspoon sugar. Combine Chinese hot mustard and sesame seeds. This grown-up chocolate fondue is delicious and makes the perfect end to a meal. 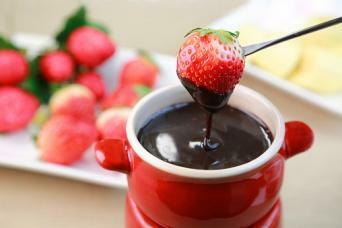 In your fondue pot on medium-low, combine the butter and chocolate and cook, stirring constantly, until melted. Stir in the coffee liqueur, heavy cream, and salt. Cook, stirring until smooth. Keep on low in the fondue pot and serve with dippers. 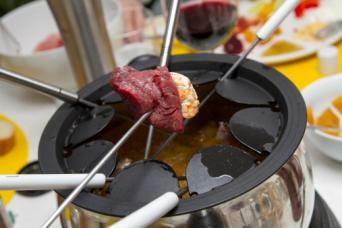 While many people associated fondue with the 1970s, it is, in fact, a very modern meal. Contemporary fondue pots have varying heat settings instead of the Sterno cans for heating, and can make everything from cheese fondue to dessert fondues. They also come in varying sizes and materials perfect for home use. 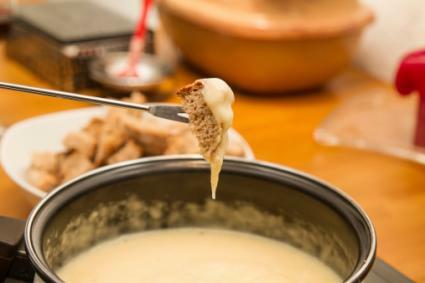 Many people enjoy fondue as an easy meal over which friends can socialize while enjoying delicious food.